Unquestionably, Nepal is one of world's top adventurous destinations. Only here, you can find an adventure day trip to multi days adventure trekking, Rafting, Mountain Biking, Everest Marathons etc. Nepal offers many different adventures activities whether you select to scale a mountain peak, or go to Bungee Jump, Canyon, ice-climb, rock climb, fly over mountains or fly an ultra-light, you will find an adventure every day in Nepal. The Himalayas have long since held a mysterious attraction to travelers and trekkers alike. Today in Nepal, here it has been a surge of extreme sports to the small Himalayan country of Nepal. Now, in this part of the world, you can experience some of the most physically and mentally challenging action sport activities in an exotic destination of Nepal. 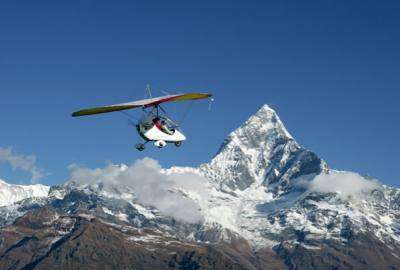 Nepal fulfills all kind of your desires for adrenaline adventure experience. We, Wilderness Excursion don't only offer treks and tour packages but we also offer short adventure holidays such as White Water Rafting, Zip line Flying, Ultra- Light Aircraft flight, Hot air ballooning, Sky Diving, Everest Marathons, Annapurna Marathon, Mountain Biking Tour, Jungle Safari, Bungee Jumping, Canoeing for adrenalines junkies that can be combined with Annapurna Base Camp Trek or whether with Everest Base Camp Trek and other tours depending on your choice.